See many more examples following this article. If the Holocaust never happened, what happened to the Jews of Europe? 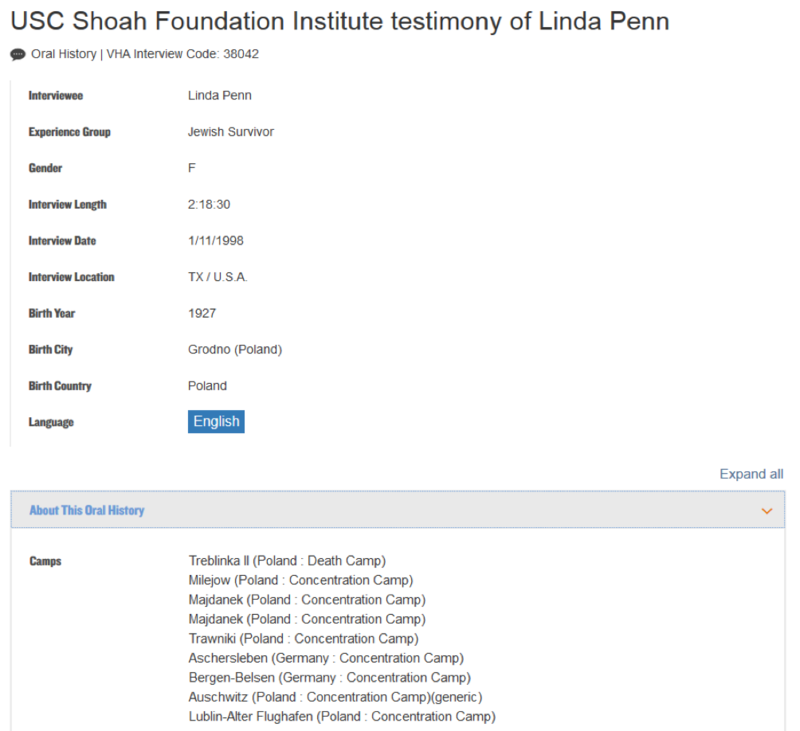 If the camps were labor or transit camps, where did the Jews go? Give us the name of one single Jew who was transited through these camps. These are the kind of responses you usually hear from people who encounter revisionism and realize that their story is not as bulletproof as they had thought. As they do not want to admit it, they have to resort to these desperate, but still-valid questions. So let’s see. 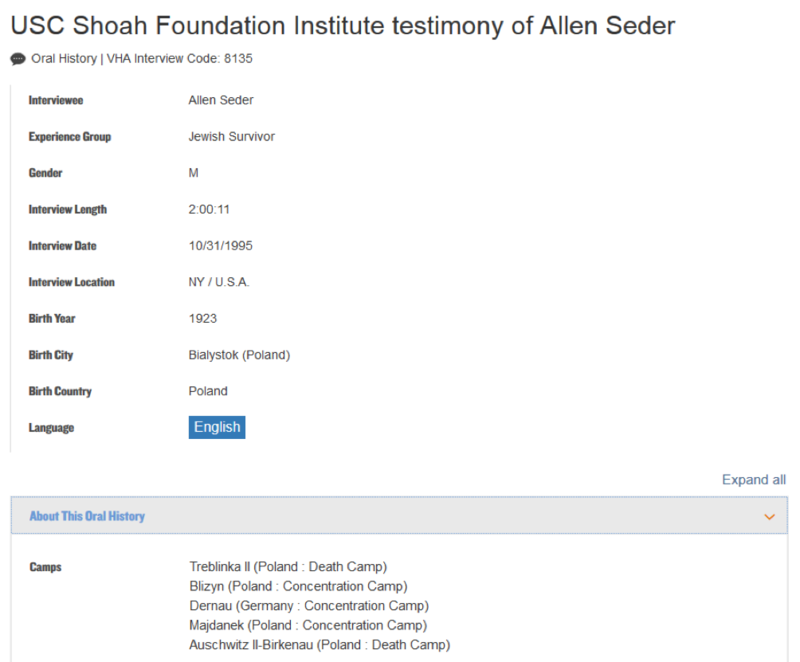 Is there evidence that Jews were transited through these supposed extermination camps? As a matter of fact there is. 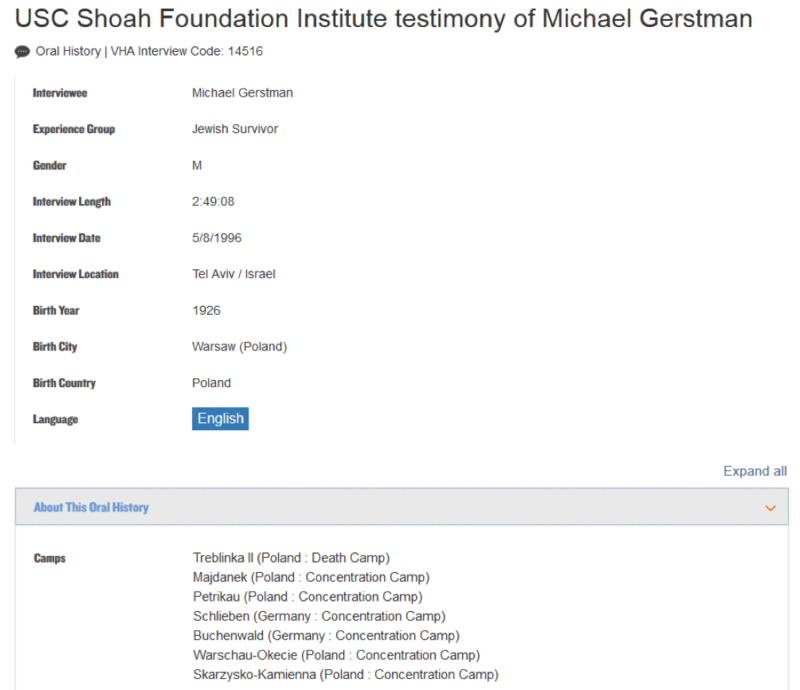 And not in some secret vault or anything, but in the database of the USHMM itself! 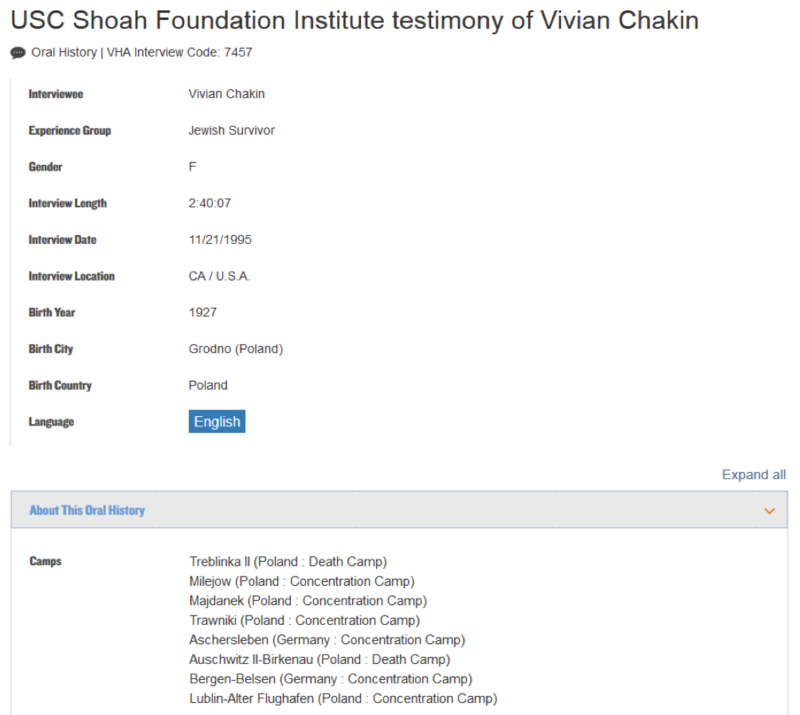 And by searching through the survivor testimonies, we actually find quite a few from one of the most-infamous death camps of all, Treblinka. Orthodox historians claim that this was a camp where all who were deported there were killed upon arrival. Nobody survived except those who managed to escape. But the survivors have a different story to tell. 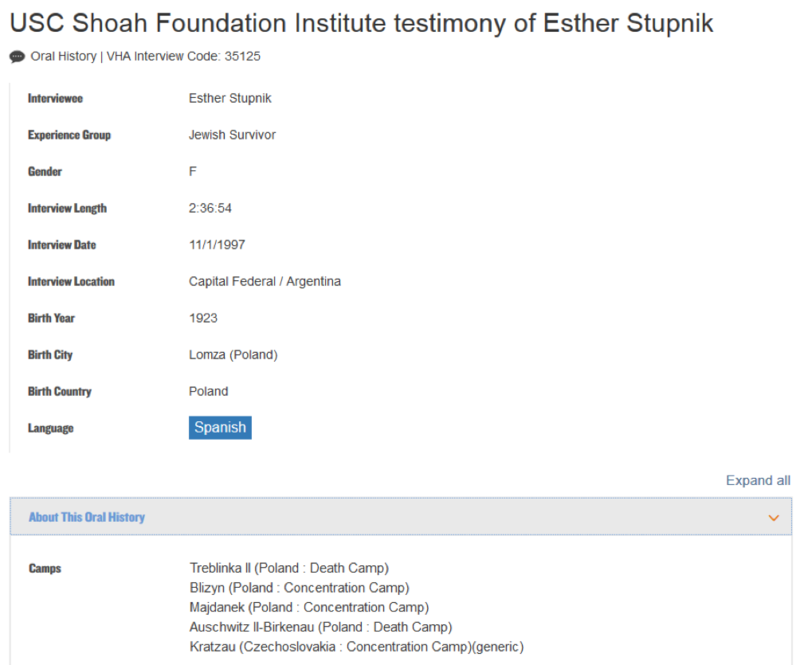 They were simply moved from camp to camp, with all of the camps clearly listed in the database. As we can see, starting with Treblinka, she went through no less than eight camps, including Birkenau. And of course, she wasn’t alone on the train. Notice that some of them were also sent to Birkenau and Majdanek, two other well-known death camps, but again they were not murdered. So there you have it. Deportees to death camps according to the USHMM, alive and well and giving interviews. Did we miss something? Makes Treblinka look more like a transit camp from this angle, doesn't it? If Jews are so sure that millions of Jews were murdered, then why do they ask such dumb questions like “what happened to them then? 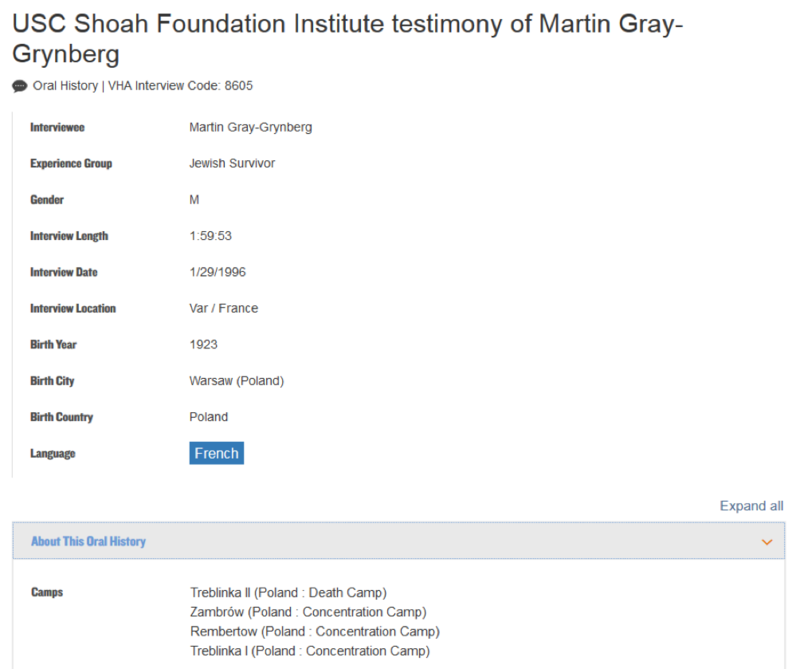 After all, Jews say ’6M Jews & 5M others’ went to huge mass graves, Jews claim to know the exact locations of these alleged enormous mass graves to this day, yet Jews cannot show us anything. "Since the outbreak of the war hundreds of thousands of Jews from Poland, Rumania and the Baltic countries have been given shelter in the U.S.S.R., and many of them were permitted to pass through Russia en route to the United States and to Palestine." Imagine in a real / legit court of law where someone claims that millions of people were murdered and dumped into mass graves, but then could not produce the claimed mass graves and the alleged contents. They would be laughed out of that court. No alleged immense human remains to be seen in alleged known locations, no 'holocaust'. 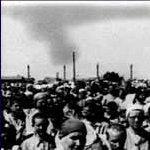 Therefore Treblinka was a transit camp, as told by many people. Also don't forget how General Patton was told to throw Germans out of their legally held homes to accommodate one million jews at the end of the war, in Germany!! 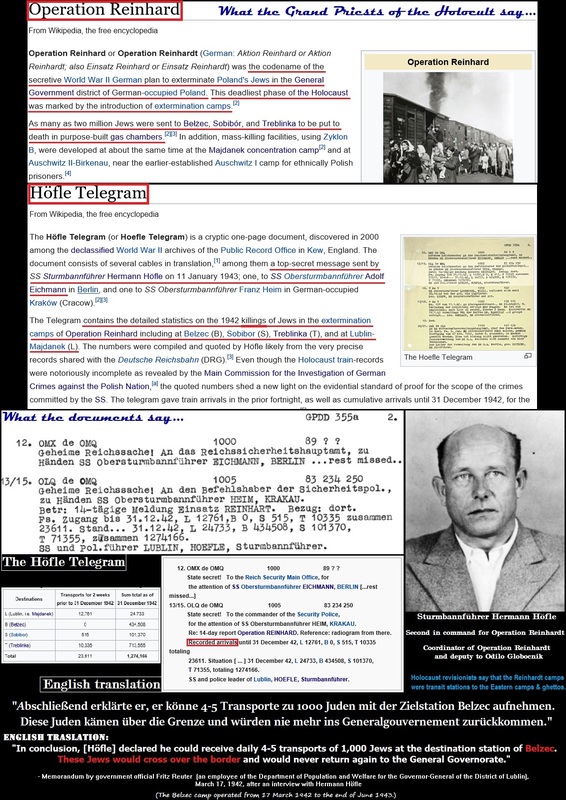 If some jews had left Germany pre-war and then the remainder were forced out during the holocaust where on earth did one million jews come from at the end of the war? Yes, it's a totally ridiculous question. "Well if 6 million didn't die, where did they all go?" It is the exterminationists, not revisionists, who claim to know exactly where they went ... but are incapable of proving it. There would be enormous pits full of corpses, bones, teeth, etc. Millions of pounds of burnt remains (not 'ash') and 10s of millions of teeth. They are claimed to be in exactly known locations, down to the meter, so what do they do? Refuse to excavate and cover the alleged "huge mass graves" with stones, obstructing any investigation. Revisionists claim they did not necessarily die, so they could be here, there, anywhere. They could have even stopped identifying as Jews which would count as a death if you go by the supposed census figures. Not in 'huge mass graves' in precisely known locations, as alleged. 1) Large numbers of Jews died from disease, exhaustion and bad treatment in concentration camps, labor camps, and ghettos. On the Eastern Front and in Serbia, many Jews were shot. Since there are no reliable statistics, it is impossible to determine the number of Jews who died as a result of such persecution with any degree of accuracy, but it could have been close to one million. For a mentally sane person, this figure would be atrocious enough, but the Jews are not content with it. They want their six million! 2) Several hundreds of thousands of Jews perished as the result of acts of war not related to their race or religion. They were killed in combat as soldiers of the Red Army, succumbed to starvation during the siege of Leningrad, etc. 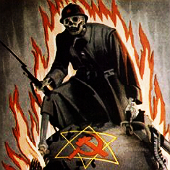 In my opinion, Soviet Jews who were evacuated to Siberia before the onslaught of the German troops and died from starvation or cold during or after their evacuation should be added to this category as well. 4) Huge numbers of Jews disappeared in the statistics. One example will be sufficient to illustrate this. Thanks to my wife Olga, who is from White Russia, I know that even decades after the beginning of Jewish emigration to Israel and the USA, the capital of the country, Minsk, is still full of Jews. However, only a small minority of them are members of the tiny Jewish community. The others have become “White Russians,” or “Russians.” They do not visit the Synagogue. They do not grow beards. They do not wear the yarmulke, Many of them now have Russian names. Menachem Rosensaft became Vladimir Ivanov – just as his cousin Chaim Goldstein in Warsaw became Lech Kowalski. Abschließend erklärte er [Höfle], er könne täglich 4 – 5 Transporte zu 1.000 Juden mit der Zielstation Belzec aufnehmen. Diese Juden kämen über die Grenze und würden nie mehr ins Generalgouvernement zurückkehren. TRANSLATION: "He concluded [Höfle] that he could take 4 - 5 transports to 1,000 Jews a day with the Belzec destination. These Jews would cross the border and never return to the General Government [for the occupied Polish Region]." Source: Jüdisches Historisches Institut Warschau (Hg. ), Faschismus, Ghetto, Massenmord, Frankfurt a. M. 1960, S. 269ff.